When French-Canadian filmmaker Xavier Dolan’s latest film It’s Only The End Of The World unexpectedly won the Grand Prix award at last year’s Cannes Film Festival, several critics expressed their disapproval at the choice, because not only did it beat a few other films that were perhaps more worthy of winning what is basically the runner-up prize of the festival, but it was also seen as quite a lot of people as a legitimately bad movie. But now having seen the film… yeah, it’s a really bad movie. But even then, it kept managing to surprise me with just how hateful and up its own derriere it was with what it thinks is some deep drama but is actually some of the most pretentious writing and directing I have personally seen in quite some time. You know the film immediately has a high opinion of itself when a title card sets the scene as “somewhere, a while ago already”, which already makes you want to punch the screen right in its pseudo-intellectual face. But the story begins proper when Louis (Gaspard Ulliel), a young gay playwright, travels home to his family with the intent of breaking the news that he’s terminally ill, and the rest of the film leaves you trapped in this domestic family squabble that is growing increasingly uncomfortable by the minute, not least because you are surrounded by possibly the worst family in the world. Seriously, this is beyond just a simple dysfunctional family; this is a clan that seriously needs counselling, because when they’re not spending every other minute shouting at each other they are busy being the most vain, self-absorbed and completely detestable wastes of human life you could ever hope not to run into over your entire lifespan. You have the makeup-laden mother (Nathalie Baye), the tattoo-covered younger sister (Léa Seydoux), the timid sister-in-law (Marion Cotillard) and, worst of all – and that’s saying a lot – the hot-tempered, verbally abusive and consistently monstrous older brother (Vincent Cassel) who for whatever reason always seems to have it out for his prodigious sibling, who outside of just being an anti-social recluse really hasn’t done anything to warrant such vile hatred. Every single one of them is insufferable to be trapped with all throughout this running time, but Cassel’s Antoine is a seriously nasty piece of work, whether he’s verbally abusing his own wife (he’s like one or two temper tantrums away from doing something far worse to her) or making his family’s life a living hell at any given opportunity, and to say he is irredeemable is a massive understatement to how much of a prick he is. The thing is, however, that I’m sure Dolan intended for these characters to be absolutely horrible, either as a unit or singularly, but the problem is they’re written so thinly that they barely register as caricatures that are so extreme in their nastiness it doesn’t seem real. He never gives us a real explanation of why they seem to have this quiet disdain for each other, and in Antoine’s case for everyone in an arm’s length, so they all just come across as two-dimensionally horrid people for no apparent reason, and are considerably boring as a result, adding insult to injury. Dolan is far more occupied by his own visual language, which he uses every excuse he can to indulge in, from the most obvious of symbolism to weird, out of nowhere Malick-type shots of nature while a questionable soundtrack plays over it. It is an abhorrent portrait of vile egotism both in front of and behind the camera, the product of someone who has clearly let his previous accolades and appraisals go to his head and given him the idea that he can do no wrong at this stage. Well, he can, and this film is undeniable proof that the lesson he needs to learn if he is to not make this mistake again is to learn restraint and consideration for others aside from himself. Nobody wants to see this kind of nasty, hateful and despicably bitter family squabble either on film or in real life, so what made him so adamant to make something that just leaves you with a rotten taste in your mouth? I don’t know what was circling in his mind – other than how awesome and poetic he thought he was being – but after seeing It’s Only The End Of The World, I am unwilling to venture further into his pretentious though process. 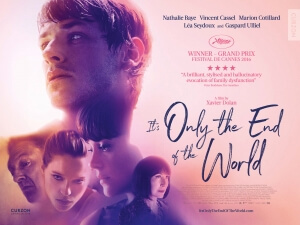 It’s Only The End Of The World is a hateful and overly pretentious domestic drama that features some of the nastiest characters you’ll see in quite some time, especially Vincent Cassel’s monstrous figure, but filmmaker Xavier Dolan is far more concerned with expressing his own vapid visual artistry than actually giving us an understanding of why these people are the way they are, making it a vile portrait of overwhelming egotism.